The GMB Friday Seminar Series welcomes Amy K Schmid, Associate Professor of Biology at Duke University on Friday, March 29, 2019. 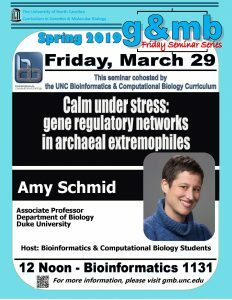 Dr. Schmid’s talk title is “Calm under stress: gene regulatory networks in archaeal extremophiles”. The UNC Bioinformatics and Computational Biology Curriculum Graduate Students host this talk. This talk is in UNC’s Bioinformatics Building in room 1131.